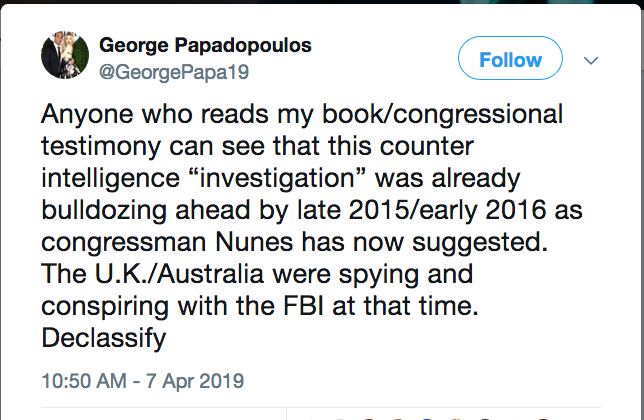 Assuming that this is entirely true - UK+AUS+FBI spying on DJT and more. And assuming DELCAS reveals this either in part or in whole. DECLAS is a diplomatic NUKE. This cannot be used because Anon's want to tell their friends they were right all along. But controllers will demand this happen now, not at the right time, as it is the only way to disrupt the plan. DECLAS will only happen after all the arrangements have been made. I think this will be used to nuke the sleeping populace and media, not the actual players. “My Sources Inside The FISA Court Say That They Are Just Waiting For IG’s Report Before Triggering Action At The FISA Court & AG’s Office. The 2nd Half of 2019 Will Be The Year of Accountability That Will Bring A Lot of People To Justice. Solomon always gives us the straight up on what's happening so I'm taking that last sentence a gospel. Wind and wind power and wind mills are code for something else? So "wind" is the word, what surrounds gives definition to the target or act? He mentions it too much for it to mean what it means. Experts. This will not age well. But let us see why it actually creates cosmic irony. In both conversations, Dowd described some of the materials Trump handed over to Mueller. For example, he pointed to the notes of Annie Donaldson, who was White House counsel Don McGahn's chief of staff. The notes memorialized many White House meetings in which the president discussed the Russia matter with top advisers. They were extensive. Dowd said it took many hours to read through them. Even though Trump could have claimed executive or other privilege to withhold them from Mueller, he instead turned them over to the special counsel's office. The White House would hand over the material, one executive branch entity to another, without claiming any privilege, provided Mueller would agree that, if he intended to use the material in any public way, he would first consult the White House. Read the above VERY carefully. From one executive branch to another. By passing the blockade. Bypassing the DOJ criminal enterprise. The legal hack, then created a system where the only person who can legally release the docs is DJT! In the end, Dowd said, Mueller "acknowledged that all the witnesses told the truth, all the documents were there, there was nothing missing, no documents destroyed." The level of cooperation, Dowd said, was "truly remarkable," all while the president distracted the world with his tweets. "The level of cooperation, Dowd said, was "truly remarkable,"
Why was DJT and team so happy to cooperate? Why will Rob Reiner pull the last remaining hairs from his head soon? See it? DJT turned over all the information and it was entered into evidence. It is NOW evidence. So what is the evidence? Well DJT was not covered by any NDA's on these issues prior to being President - so any bugging conversation during the campaign! After he became President? Well read the above to see how this worked and why the dems have no access to it - ever. Cosmic Irony. Demand an investigation that formalizes a way to enter evidence into a system that might not otherwise be able to get at it. And do it with protections in place for leaking and future issues. 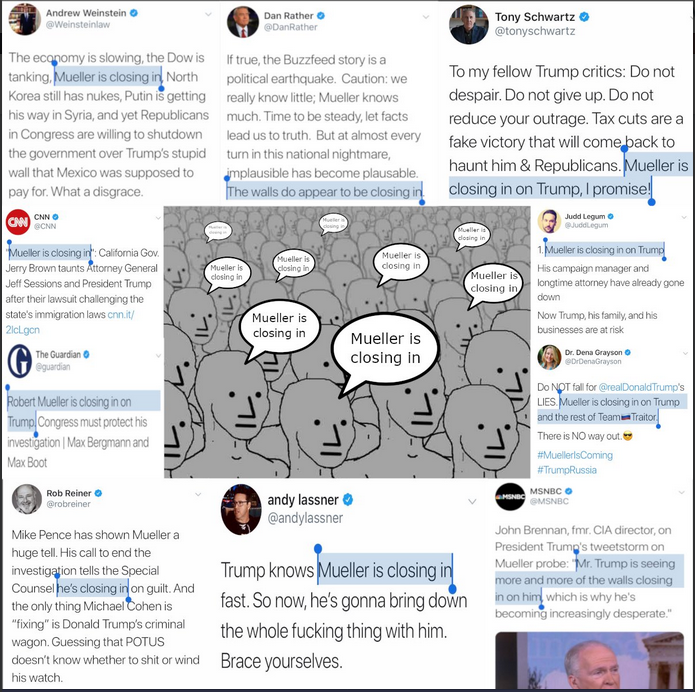 Oh boy, now the Left will determine Trump colluded with Mueller. Have we ever covered Kay Griggs in these threads? But the real story for public consumption isn't the private divorce court details. 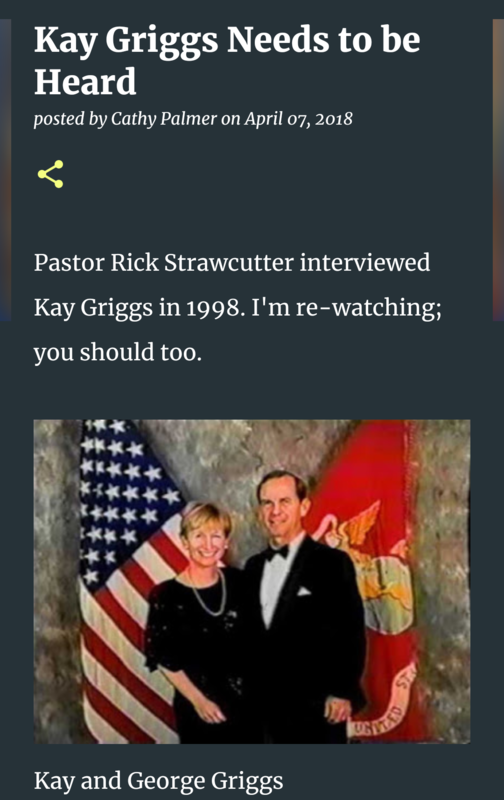 It is the secret military information about drug running, weapon sales, sexual perversion and assassination squads she learned firsthand from her husband, U.S. Marine Corps Col. George Raymond Griggs, now remarried and living in Mirror Lake, NH. "I became a whistle blower and received death threats," said Griggs this week in an extended telephone conversation from her Tidewater, VA. home. "I finally wound up living for safety reasons with Sarah, the dean of the White House Press Corps, who had been with every president since FDR and was in Army intelligence and also an attorney's daughter from Texas." Now this week Griggs decided to tell her story again, saying "I will keep repeating it to anyone" and adding after 9/11, the war in Iraq, the London bombings and the fear of terrorism, the "American people are at a point were they are ready and willing to hear the truth." Although they may be shocked, Griggs said the "truth will set you free," even if it means facing up to the highest form of corruption, including sexual perversion and government sponsored mob-like hits orchestrated by high-ranking military and government officials. Much more at link and here is her 8 hour original interview from 1996. How have I missed this all this time??? IG Horowitz's comments in the June 2018 IG report on FBI misconduct, reminded me of the remarks Comey gave about Hillary in July 2016. Horowitz outlined several instances of obvious BIAS against President Trump by Strzok, Page, the Media, and others.. But in the summary he said, "There was no obvious bias". Comey: Hillary committed several crimes. I'll outline them for you now. blah blah blah. Comey: Now that I've outlined Hillary's crimes for everyone, the DOJ/FBI doesn't feel that any of them were really criminal enough to prosecute. Have a nice day! Comey was under the influence of the DOJ's Loretta Lynch. Was Horowitz under the influence of DOJ's Rod Rosenstein??? I remember parts of her story while listening to a Jeff Rense show one night about 15 years ago. For me then it was just too fantastical and if true why wasn't she put in a concrete coffin and dropped out over the Mariana Trench. ?